A super early in the morning flight home from Barcelona meant we didn’t fancy the three hour drive from Zaragoza at before the crack of dawn. A decision was taken to stay somewhere within half an hour of the airport so we wouldn’t have to get up at a silly hour. We thought about Barcelona itself briefly but discarded that idea. Mainly because we had stayed in the city for a week a year ago and fancied seeing somewhere different, secondly getting from the city to the airport might be a hassle we thought. The map was consulted and a list of potential places was drawn up. 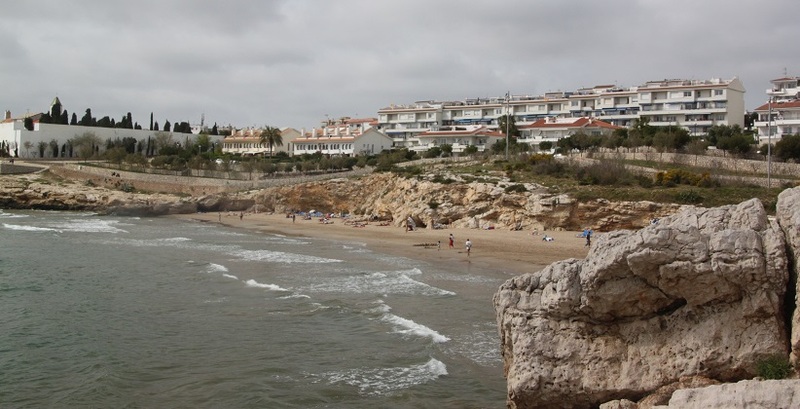 Sitges, a seaside town not far from the airport (16 miles) made the short list. 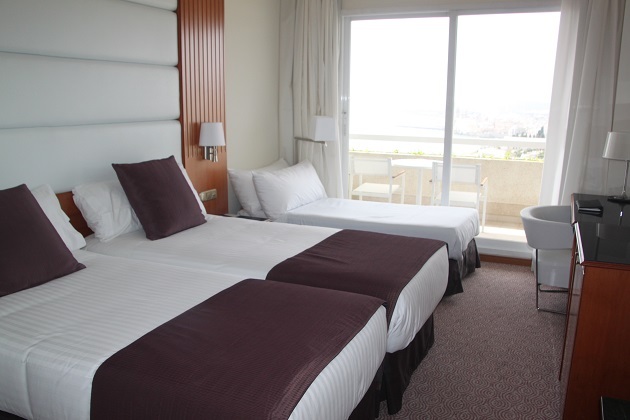 We didn’t know too much about it but when we discovered there was a Melia hotel near the waterfront that was it. We stayed at a Melia on Tenerife a few years ago, Son loved it so much (we all did) and still raves about it so we figured this might be a good choice. The drive from Zaragoza took just over 3 hours, we were glad to eventually see signs for Sitges and pull into the little town. Very glad of our trusty Sat-Nav, not sure we would ever have found the hotel in the maze of narrow, winding, twisty streets under our own steam. The hotel disappointed at first sight. A huge and modern building without an ounce of kerb appeal and completely charmless. It didn’t help that half the population of Spain seemed to be sitting on the steps around and about. There was a dance competition in the conference centre as we were later to discover and people had come from all arts and parts. Reception was equally busy and bustling but they dealt with us fairly efficiently and soon we were swishing up to the 5th floor in a very fancy glass lift. Our room was fine – super hot though – with double bed and proper single bed, not massive but big enough and it had a very luxurious bathroom. The best thing was the glass doors at one end with a balcony and beautiful views over the sea and the old town of Sitges. We didn’t really have too much time to sit and chill there but it was nice to have the view. A bit of exploring was called for – the hotel overlooks (from a few streets higher up) the Aiguadolc Marina and we found a short cut down there. Lots of boats, lots of lovely waterfront restaurants and the perfect place to chill after a long drive. 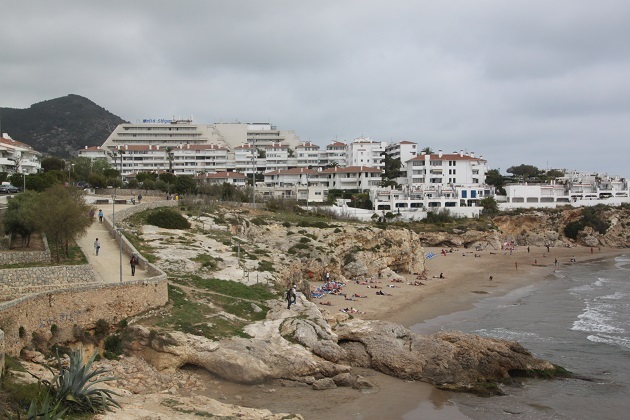 Sitges looks very pleasant and we also like Melia hotels, spending a week in one in Palma at Easter and a few days in another in Madrid a few years ago. We stayed at the Gran Melia Resort on Tenerife and loved every bit of it – this was not quite the same experience but still a very nice hotel (from the inside!). It also had a great location for exploring the little town which was perfect since we were only there 1 night. Good honest review. Sometime hotels are a base, other times they’re a special experience in themselves. This was most definitely a base – I think having had an amazing time at another Melia hotel in Tenerife probably raised our expectations too much. It wasn’t bad here, just not up to what we expected! You have convinced me to go to Zaragoza but I think I will take the direct Ryanair flight from Stansted. It actually works really well, my husband prefers to use this route to get to Zaragoza even though it involves a journey from up north!! The flight leaves Stansted early afternoon and the return is late afternoon so you have almost the whole of the last day in the city. Zaragoza airport is also superb – really modern but really small with only a handful of flights each day – a pleasant experience! Stansted is not my favourite airport for those of us who live up north but it has the most flight choices. A pain to get there for sure. The room was lovely and the hotel was good, I think we were spoiled by our previous experience though and the fact it was so incredibly busy. We did enjoy our one night in Sitges though! It is a lovely little place. I saw a travel show about Sitges once Joy and I think it’s very popular especially if you have a boat! The views look lovely even if the hotel wasn’t quite as pretty as you’d hoped. At least you got to check out a new place too and far better than a lengthy drive in the morning! I think we were so blown away by the last time we stayed in a Melia hotel that our expectations were just too high here Rosemary!! It wasn’t very pretty but inside was nice and our room had that lovely view, also the lie-in (well sort of) in the morning was definitely worth it! I love the way you chose the location! I often those kind of decisions lead you to the best hidden gems so hopefully Sites was worth it even though the hotel from the outside didn’t offer any charm. That’s often how we make our decisions for places to go – a bit random but it seems to work out (mostly!). The hotel was fine – the room was nice and I suppose that’s what really matters. It definitely lacks kerb appeal but sometimes you just need a clean comfortable room to bed down in. I’ve heard good things about Sitges a lot of my friends have stayed there. It is a lovely little resort, I plan to do another post about the town itself and how much we enjoyed just strolling around. The beaches looked great and really good for children too although we didn’t have enough time for that. Those views were amazing – unbeatable. So sorry to hear that Sitges was a bit of a disappointment for you! We love it there and used to go all the time when we lived in Barcelona. Of course, we weren’t staying there. I always wondered what that white building was at the end as we always based ourselves nearer to the Cathedral on the other end. Did you make it down towards the Cathedral as that’s where the beauty of Sitges is – as well as all the little shops and restaurants. We liked Sitges itself, just a bit disappointed by the hotel and I think we were probably being picky really!! The room was fine, we had a gorgeous view and the location was good for exploring, just the sheer business and volume of people around and about was a bit overwhelming really. We loved strolling around Sitges – plan to do another post about that – and sat for ages with a margarita just watching the world go by!! 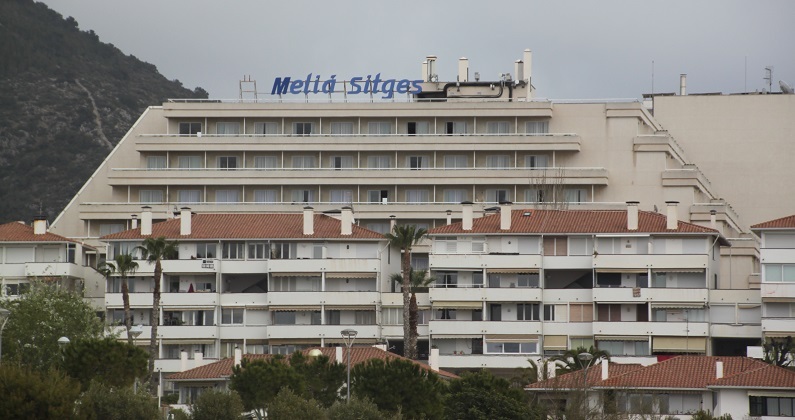 Most of the hotels in Sitges are tiny boutique ones, so I can imagine there is a lot of foot traffic at the Melia because it’s the largest hotel in the area. I know what you mean about having the expectations for a certain chain though. FYI, their location in Puerto Banus (by Marbella) is beautiful! I’m glad you enjoyed Sitges though – it was one of our favorite places to go when we wanted to get out of the city. Thanks for the tip on Puerto Banus Julie – good to know for the future! Sorry about the hotel that’s too bad. We were actually going to spend a night or two in Sitges this summer had we planned our trip. A friend of mine stayed there last August for 2 weeks – her friend has a house there so a different experience – and said it was quite amazing. Rode their bikes everywhere, very pretty and relaxing. We will prob go if we go ahead with our trip next summer. It is a really pretty little place, I plan to do another post about our wanderings and what we found. I think it would be ideal with bikes, very flat and plenty of car free areas so just perfect. The hotel wasn’t so bad either, being a bit picky there, just the one we stayed in before was amazing and I think that, together with the fact this one was so incredibly busy just left us little cold. Had we stayed longer in the hotel and had more time to sit out and chill on that balcony with those views maybe my opinion would have been different! Wow! That place looks gorgeous. It is a lovely little place, the old town is just gorgeous and perfect for wandering. It looks like a neat place to visit! The hotel shape reminds me of the Mayan pyramids in Mexico, and Belize. That’s probably the effect they were after I think!! It is a lovely little place, we loved the old town especially, perfect for wandering. I think it is still the same although we were tucked up early in bed that night so didn’t see any partying! !